Micromax, an Indian mobile manufacturer, has recently launched the device Micromax Canvas A88 and this is a very interesting launch as the device is coming with JBL headphones. The launch of this device clearly indicates that the company this time is targeting the user form the group of music lovers. This is a very interesting thing about the micromax that the company target different user group with its different device and hence the portfolio of the company is always interesting to check for. If we check the previous launch of the company we can see the Canvas HD 116 was the first Indian phone coming with quad core processor and targeted audience was the smooth performance expecting user, Ninja A72 for Users who only want a big screen to watch movies and videos and then Canvas 3D for the people who want to get the 3D experience on the device. So isn’t the portfolio of this Indian company is interesting? Coming back to the new family member of canvas family Micromax A88 Canvas, the price tag of the device is cheaper than the Nokia Lumia 520 and hence today we will be comparing the canvas A88 with Nokia’s device because though the Micromax Canvas Music A88 is a dual-SIM and the OS is different for this devices(Lumia using Window Phone 8 and canvas using Android 4.1 Jelly Bean) the price of the device is in the price range. Micromax Canvas Music A88 will be coming with the main rear camera of 5MP which is same as the Lumia 520 but the main thing that will matter here is the quality of the image. The Lumia will definitely provide a good quality image as it has been provided with many quality feature for camera but still the 5MP of micromax can be found competing it as it is coming with the dual LED flash. The Lumia does not have the front camera which eliminates your option of video chatting with your friends and this is something where Canvas A88 wins the points as it will be coming with the 0.3 MP front facing secondary camera. Coming toward the processor. the Micromax A88 will be processed with MT 6577 1GHz Dual core processor which looks bit poor compared to the 1 GHz Qualcomm Krait, Dual Core processor of Lumia. 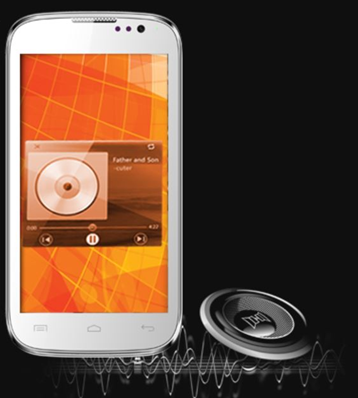 But if you are a music lover and don’t want to go for many applications installed in the device the micromax processor can also provide you a good satisfactory performance. But again in the battery the Micromax earns the points. The micromax A88 will be powered by 1800 mAh battery where Lumia got the 1430 mAh of battery. Though the technical feature of the device doesn’t looks so attracting but the special feature with this phone is the availability of JBL Tempo headsets which will provide you the wonderful experience of music. And hence if you are not a heavy application user and doesn’t want any innovation to be done on your device then this is really a good device for you .The MLive web service where you will be able to download the unlimited number of songs on your mobile phone will add a ease to download the song. The device will be available at the price of 8,499 INR on saholic.com as well as on flipcart.com so you can order the device online today.